Nursing assistants in Maryland earn a lower income than other medical professions. According to the BLS (Bureau of Labor Statistics), around 26,780 CNAs were employed, and employment per 1000 jobs was 10.57. The mean annual salary was $28,880, and hourly wages were $13.89, as of May 2013. Since the demand of nurses is growing at a faster rate, there are chances that they will receive decent and satisfactory salary packages in the upcoming years. As per indeed.com, the average salary of nurse aides in the state of Maryland, in December 2014, was $25,000, which was 3% higher than an average salary for job postings nationally. So, get yourself enrolled in a recognized program school and pursue a thriving career. 90% of CNAs made less than $37,330; 10% made more than $37,330. 75% of certified nurse assistants earned less than $32,240; the remaining 25% earned more than $32,240. 50% of the employees waged less than $27,620; the rest 50% earned more than $27,620. 25% were remunerated with annual wage less than $23,630; 75% were paid more than $23,630. 10% of CNAs received less than $20,850; 90% were offered more than $20,850. Geographic location plays an important role in deciding the salary packages of a nursing assistant. It can be concluded from below table that Bethesda, Bowie, Gaithersburg, Germantown, Potomac, Rockville, Silver Spring and Waldorf were the highest paying cities in MD with a median pay of $33,891 per year, monthly median salary of $2,824 and median hourly wages of $16 as per the figures provided by salary.com. Frederick was the lowest paying city that salaried the CNAs with $30,505 yearly, $2,542 monthly and $15 on an hourly basis. 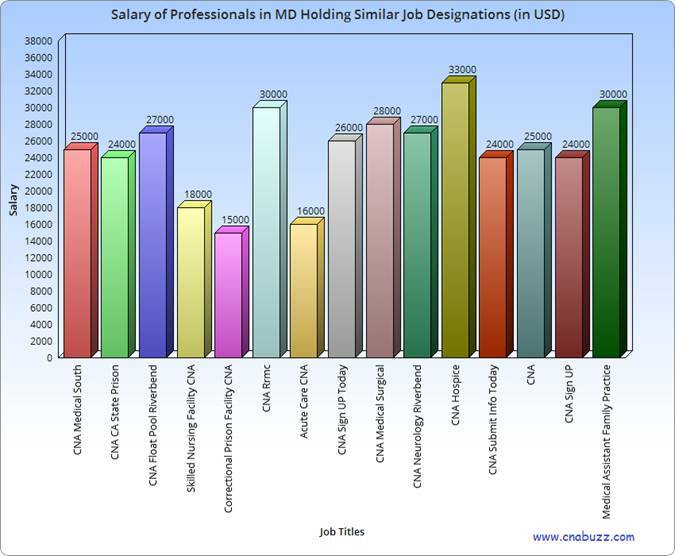 The table shown below gives a detailed view of the salary of CNAs with different job titles. According to indeed.com, in December 2014, CNA Hospice earns $33,000 which is highest among all. All the remaining professionals earn between $15,000 and $30,000. According to the BLS, the job opportunities of a CNA are expected to rise by 21% in the coming years from 2012 to 2022. With the increasing population, the need for nursing assistants will also increase. The nursing demand may decline due to the dependency of nursing homes on government funding. However, choosing a career as a CNA is a good choice, especially for those who want to work for the welfare of the society. Question 1 – Can you suggest me some of the best paying nursing assistant job titles in the state of Maryland? Answer – According to indeed.com, in December 5, 2014, CNA Hospice is the highest paying job title with an annual income of $33,000. Other job titles include CNA Rrmc ($30,000), Medical Assistant Family Practice ($30,000), CNA Medical Surgical ($28,000), CNA Float Pool Riverbend ($27,000), and CNA Neurology Riverbend ($27,000). 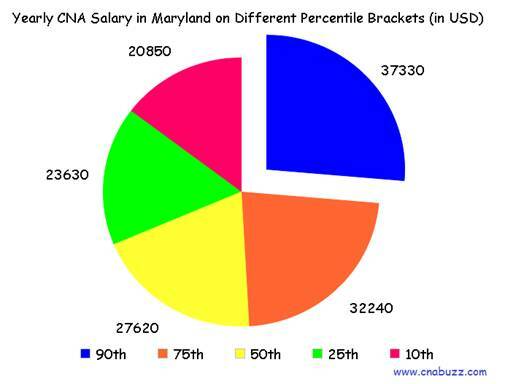 Question 2 – In Maryland, what is the average salary of a CNA? Answer – According to the indeed.com, you can expect an average yearly salary of $25,000, which is 3% higher as compared to the average salary for job postings all over the country.